Former Vice President Joe Biden is a lot of things, but a fool isn’t one of them. OK, fine, a fool is one of them, but this next move, if true, is so obviously clout chasing that it’s embarrassing. According to sources very high up in Biden’s business, the BFF to the best president to ever hand dance with his wife in the Oval Office is not only considering a run for the White House, he’s reportedly considering grabbing one of the hottest names in the Democratic Party to be his running mate: Stacey Abrams. Biden is another old white guy, and that’s his fault. Vermont Sen. Bernie Sanders is an old white guy, but he’s not another old white guy, and he did that with policy and conversations and Killer Mike, before having a Killer Mike was cool. Has anyone talked with Anita Hill? Has Biden apologized to her yet? While Abrams, 45, was unsuccessful in her run for Georgia governor, she has shown that she’s a goddamn Democratic juggernaut. She’s maintained a high profile since that election and was so hot she delivered the Democratic response to President Trump’s State of the Union address. Side note: I hate all caps but I’m bout to all caps y’all right here. BIDEN HASN’T EVEN DECLARED THAT HE’S RUNNING FOR PRESIDENT BUT HE’S ALREADY MULLING OVER ABRAMS AS A RUNNING MATE! 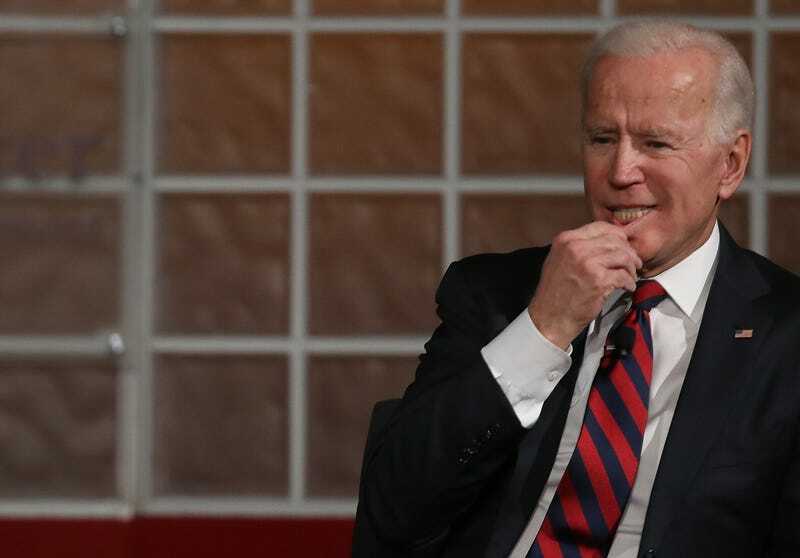 According to Axois, Biden met with Abrams last week, but Abrams has met with other 2020 Democratic candidates as well, including Sens. Elizabeth Warren (Mass. ), Kamala Harris (Calif.) and Cory Booker (N.J.). If Biden is going to run for office, then do it like everyone else. Officially add your name to the 3,456 Democrats who’ve already declared, but don’t try and level up using Abrams’ name because you’re an old white man who’s going to have trouble pulling the South. Also, don’t think about adding a black woman to your ticket before you’ve even declared and have yet to make things right with the black woman you scorned.